To simplify entry into the United States of contestants and all others officially connected with the Games, and to identify them quickly and easily, the Committee drew up a simple form of Identity Card which, when filled in and properly signed, the Government agreed to accept as a valid travel document in lieu of passport. The Government further agreed that persons presenting these Identity Cards would be granted the privilege of free entry and the usual customs courtesies and facilities accorded distinguished foreign visitors; and also, that there would be no visa charge by the consular officers of the United States and no head tax. The Identity Cards were serially numbered. 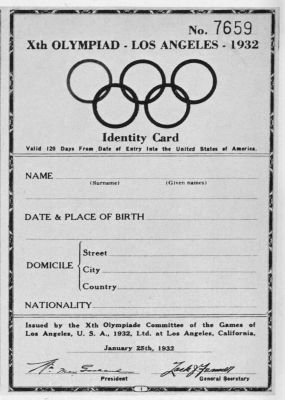 A supply, consecutively numbered, was forwarded to each National Olympic Committee, and each Committee became responsible for the proper issuance of the cards to athletes, managers, coaches, team attendants, members of Committees or Federations, members of Juries, accredited Press representatives, and members of immediate families and personal servants. Complete records were kept of those to whom Identity Cards were issued, and the card number in each case became an identification number. This number was used on all travel certificates and on all entry forms and became the key to the identification of all Olympic representatives. The lists of persons to whom Identity Cards were issued were used by the Credentials Department in preparing credentials, at the Olympic Village in checking reservations and assigning quarters, and in many other ways. The Identity Card when properly completed in accordance with the following instructions and indorsed by your Government as indicated on page 3 of the Card and issued to persons officially connected with the Games of the Xth Olympiad will, when visaed by an American consular officer abroad, be accepted by the Government of the United States of America as a travel document in lieu of a passport for entry into the United States. Such persons may, however, desire also to obtain a regular passport appropriate to their case from the Government of the country to which they owe allegiance . In such a case the visa if granted would be placed upon the passport rather than upon the Identity Card, and the visa will be without cost if an Identity Card is presented. If the proper Department of the Government of your country will complete page 3 of the Identity Card, thereby approving the Card as a valid travel document issued to a citizen or subject of your country, it will be unnecessary for the person to whom the Card was issued to have in addition a passport or other travel document, and upon establishment of non-immigrant status by the applicant the consular officer of the United States to whom application for a visa is made will issue a temporary visitor's visa for which NO FEE will be collected. The National Olympic Committe e of any country may consult with the American consular officer in the city where the National Committee has its head office in regard to making arrangements to facilitate the examination of the persons to whom it is contemplated the Identity Cards shall be issued. It is suggested that arrangements be made for the members of the group to consult the appropriate consular officer to whom they will apply for visas sometime in advance of their sailing in order that sufficient time may be available in which the consular officer may make such inquiries as may be found necessary. ( 2 ) The Secretary or other official of the National Olympic Committee will bring the original and a copy of this list with him to Los Angeles and deliver these two copies of the list to the office of the Organizing Committee, and keep a copy of same in the office of his Committee and have with him on the steamer extra copies of same so that they may be furnished to, or examined by, government officials should the occasion arise, such lists to bear the name of the National Olympic Committee and the signature of its President and/or Secretary. All persons coming under any one of the five groups or classifications shown on page 2 of the Identity Card will have to secure their Identity Cards through the office of the National Olympic Committee and your office will personally issue the Identity Cards to such groups, keeping a record of same on the above referred to lists, under the group or classification indicated, and be responsible for this procedure. The Secretary or other official of your National Olympic Committee will deliver to the office of the Organizing Committee, at the same time the two copies of the list are delivered, all unused Identity Cards so that all of the Identity Cards issued to your Committee will thus be accounted for. When the Identity Cards are being completed in the office of the National Olympic Committee if an error is made DO NOT ERASE OR OTHERWISE ENDEAVOR TO CORRECT SUCH CARD; cancel such Card, issue a new Card and return the cancelled Cards to the Organizing Committee as provided for above.